Given a non-negative integer skyline height list, answer how many uninterrupted 1-unit-high horizontal brush strokes are needed to cover it. Simply a greedy algorithm which scan from left to right, only draw lines if needed, and draw it as long as possible. This is using the algorithm that was first found by @tsh. If you like this answer, make sure to upvote their answer as well! Each time a skyscraper is lower than or as high as the previous one, it can be painted 'for free' by simply extending the brushstrokes. For instance, painting skyscrapers \$B\$ and \$C\$ in the figure below costs nothing. On the other hand, we need 2 new brushstrokes to paint skyscraper \$E\$, no matter if they're going to be reused after that or not. For the first skyscraper, we always need as many brushstrokes as there are floors in it. An improvement on Lynn's solution that tracks the previous element p instead of looking at the next element. This makes the base case and recursive call shorter in exchange for needing to invoke (0%). max(h-p)0 could be max h p-p for the same length. Line 2 could be f[a]=a if I didn't also have to handle the case . -5 bytes thanks to ngn! So to start we have zipWith(-). 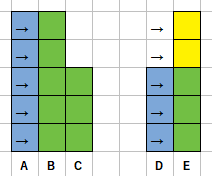 This takes two lists and produces a new list of their pairwise differences. We then combine it with x and (0:x). (0:) is a function that adds zero to the front of a list and by combining it with zipWith(-) we get the differences between consecutive elements of that list with a zero at the front. Then we turn all the negative ones to zero with (max 0<$>). This creates a new list where each element is the number of new strokes that has to be started at each tower. To get the total we just sum these with sum. Pretty much @Arnauld's algorithm. Saved one byte (thanks @LuisMendo) by casting to uint64 rather than selecting ) positive entries. A port of my 05AB1E answer, which itself is similar to @tsh JS answer. 1 byte saved thanks to Oliver. Delete all overlaps with the next tower, which don't need a new stroke. When one tower is painted, it takes a number of brushstrokes equal to it's height. These brushstrokes translate to all the following ones, which is indicated here by subtracting the current tower's height from all other towers (and itself, but that doesn't matter). If a following tower is shorter, then it will be pushed to a negative number, and this negative number will subsequently subtracted from the towers that follow (indicating brushstrokes that could not be translated from a previous tower to the next ones). It actually just subtracts the number from all tower heights, including previous ones, but this doesn't matter because we don't look at the previous ones again. I feel like this solution is more elegant than the first one. It goes through the array with a two-value tuple as a starting value, picking up values, and stores the value before it in the second part of the tuple. Yet another port of @tsh's marvellous answer. Takes the sum (s) of the positive values (>#0) of the deltas (.+) of the input with 0 prepended (+0Q, trailing Q inferred). Try it online here, or verify all the test cases at once here. This was the solution I wrote before browsing the other answers. 0) ; and get the sum element of the last value of the accumulator. Note that I used subtraction instead of addition because it allowed me to write (p=x) as right operand in the same statement. Input is a column vector, using ; as separator. A port of @Arnauld's solution. Not the answer you're looking for? Browse other questions tagged code-golf number array-manipulation geometry counting or ask your own question.